Funded entirely by member dues, the Association organizes annual road maintenance to prolong the life of the roadways that all homeowners in the Association are responsible to maintain. This maintenance primarily involves application of liquefied asphalt sealing of the cracks arising from the annual freeze/thaw cycle and, in limited areas, the removal by jackhammer of deteriorated or sunken areas and installation of new asphalt patches. 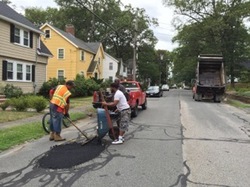 This work significantly extends the life of our streets, saving each homeowner money in the long term by reducing the frequency of total road surface replacement, which is very costly. Keeping the roads in our neighborhood in good condition also saves wear and tear on our vehicles as we enter and exit the neighborhood. It benefits our property values and makes the area a more pleasant place to live in. Even if your street hasn't been patched or sealed recently, your household benefits from this work. The Association also organizes infrequent replacements of road surface. This was last performed in 2000, at considerable expense, and requires support of two-thirds of households on a street-by-street basis. Payment of annual dues helps to forestall this undertaking. In July 2017 the association arranged the repair of potholes and other degraded areas on Coolidge, Grand View, Hawthorne, Kenilworth, Murray, Perkins, Puritan, and Stevens Terrace, plus portions of Cedar, Fountain, Pine Ridge, and Spring. ​In September 2017, the association hired City Sealcoating to perform crack filling as needed throughout its area. Come to our annual meeting or subscribe to our email updates for news about upcoming road work this summer.